You gotta give the people what they want, and they wanted Gavin Roberts. Gavin gets it, barrel, roundhouse and a closeout drop wallet. Great variety and a performance that was well connected and stylish. He mixed it up, we weren’t expecting the dropped wallet at the end, were you? Joshe’s commitment to the tail slide as a first turn really got us excited, he then backed it up with a great fin whaft with little room to spare. Commitment, variety, and flare give him the nod for our vote. Johse Faulkner is my pic for this month. The way he made it out of that layback with enough speed to still bust the fins was really impressive. The wave quality wasn’t the best but in my book, that combo was the hardest to do. The other entries just had that dead section where pumping was necessary. Gav Roberts came in a close second but the pumping broke the comb, unfortunately. Joshe Faulkner takes it for me, two solid turns linked together with aggression and great technique. The more I watch it, the more I love this Combo. Gavin Roberts coming in a close second with this well worked line down the KZN south coast. Better luck next time Gav! The Monster Combo is just starting to stretch its legs, as it heads into the third month of competition. February saw less than ideal conditions around the country. March is here and a couple of entries have made there way in. With so much potential on its way, grab your chom and your iPhone, set’em down in the shade and get filming. We hungry for them Combos!! Two or more maneuvers linked together with very little or preferably no pumps at all. In my eyes, as soon as a surfer has to generate speed after a maneouver via pumping hard/ racing, the combo is then broken. 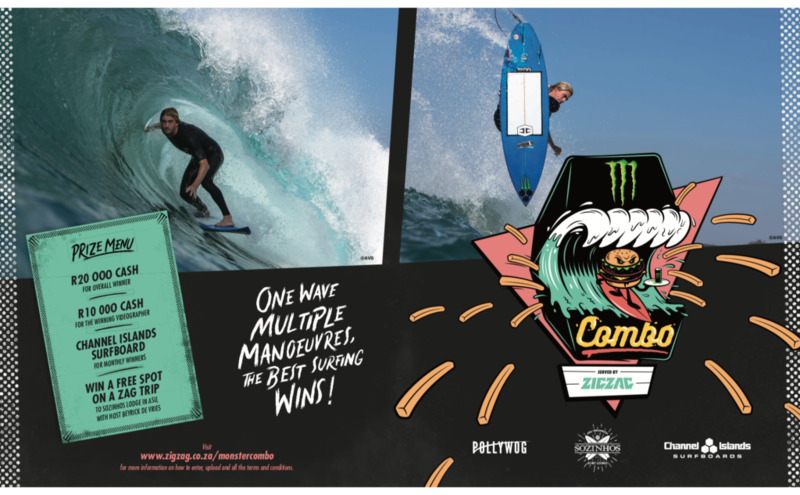 Therefore two massive maneouvers on a wave with racing in between are not counted as a combo. The dream reward of reading the first section right is coming out of that maneouver with enough speed to go straight into the next maneuver without pumping and I believe Eli did that really well.